Freelancer.com won the Webby Award for Web Employment as well as the Webby People’s Voice Award for the same category in The 20th Annual Webby Awards. This cements Freelancer’s spot as the leading freelancing and crowdsourcing marketplace as it adds two more Webby Awards to its name. 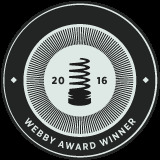 Freelancer has now won a total of 10 Webby Awards in five short years -- a huge achievement for the company and its close to 19 million users. The Webby Awards is the Internet’s most respected symbol of success, presented by a judging body of more than 1000 members comprised of Executive Members, leading Web experts, business figures, luminaries, visionaries and creative celebrities, and Associate Members who are former Webby Winners, Nominees and other Internet professionals. Over 2.5 million votes were cast for the People’s Voice Award for the favorite nominees, after receiving a record number of nearly 13,000 entries. The star-studded 20th Webby Awards ceremony, featuring 5-Word Speeches from the winners will be held at Cipriani Wall Street in New York City on Monday May 16, 2016. Hailed as the “Internet’s highest honor” by The New York Times, The Webby Awards is the leading international award honoring excellence on the Internet, including Websites, Advertising & Media, Online Film & Video, Mobile Sites & Apps and Social. 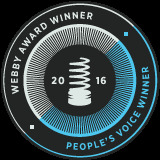 Established in 1996, The Webby Awards received nearly 13,000 entries from all 50 states and over 70 countries worldwide this year. The Webby Awards is presented by the International Academy of Digital Arts and Sciences (IADAS).